Rachel and Kirsty are visiting beautiful Greenfields Farm. They've been given the very special job of taking care of all the baby animals that live there. But the farm is not as peaceful as it seems . . . The ducklings are barking, the lambs are meowing, and the foals are oinking. Jack Frost has kidnapped the Farm Animal Fairies' magic animals and everything at Greenfields is all mixed up! 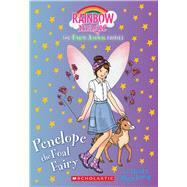 Penelope needs Rachel and Kirsty's help to get her magic foal back. They're determined to save it from Jack Frost's icy petting zoo!